this orange flavored morir sonando...delicious!! 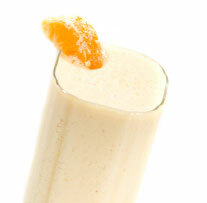 this great and delicious recipe is a lemon or orange based shake made from lemon or orange juice, sugar, powdered milk, regular milk and crushed ice mixed in a blender until soft and smooth,and this tangy drink explodes in your mouth(not literally)and is refreshing and cooling for any hot day! Try it! thanks Eileen. Ruth introduced me to this when we met and I naturally thought -- "Curdled orange juice!! Yuk!"... BUT in fact it is a delicious and refreshing drink as you rightly state! Readers do try it -- you'll be surprised. Instead of powdered milk, if we can get it, we use evaporated milk... very sweet and less likely to curdle... A tip: You do need to drink it swiftly though as the curds will separate out, so you need to keep stirring to enjoy at its best! I love to take tangy flavored drinks. Is it fine to use only powdered milk and omit the regular milk. Orange gives the splashing fresh taste to drinks and is very good source of vitamin C.
This is of course damn delicious. It tastes like strawberry and orange as well. Mostly it is orange, but the small strawberry taste makes it so much more special. I just loved it. It is a great drink to have in the summer. I know it sounds weird but trust me it's good. I've had this drink since I was a kid and now my grand kds ask for it. but for a tang add some cinnamon sugar, and remember you herd it here first!! ... is indeed one of our treasured, delicious dominican drinks! And yes, it is probably the hardest thing to imagine mixing (orange juice and milk),but a good comparison would be to think of it as a yummy icy liquid creamsicle. When I present it that way, people swoon for it!! Dreaming While Dying... or To Die Dreaming... "Morir Soñando" is one of those things you just think shouldn't work: mixing orange juice with milk!! But it somehow does, and is one of those flavors that really is truly Dominican and truly memorable. It's good to make it nice and chilled and instead of powder milk, maybe use tinned evaporated milk which also works a treat. Thanks for the recipe contribution Eileen!